Twelve doctors employed by the firm that is paid £100m a year to assess people claiming disability benefit are under investigation by the General Medical Council over allegations of improper conduct. The doctors, who work for Atos Healthcare, a French-owned company recently criticised by MPs for its practices, face being struck off if they are found not to have put the care of patients first. The Observer has found that seven of the doctors have been under investigation for more than seven months. The other five were placed under investigation this year following complaints about their conduct. It is understood that the majority of allegations concern the treatment of vulnerable people when the government's controversial "work capability assessments" were carried out, but the GMC refused to comment on individual cases. The development will add to fears over the pace and radical agenda behind the government's welfare-to-work policy, which led to protests in Westminster in May by thousands of disabled people. 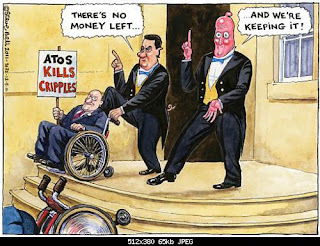 It will also raise concerns about ministers' commitment to Atos Healthcare, which was recently granted a three-year extension on its contract. The government has repeatedly publicised figures showing that the "vast majority" of claimants for employment support allowance (ESA), which has replaced incapacity benefit, are fit for work. But four out of 10 of those who appealed the decision by Atos - whose parent company is run by a former French finance minister, Thierry Breton - to deny them benefits are successful on appeal, a process that costs the taxpayer £50m a year. Last month Atos, whose staff assess around 11,000 benefit claimants a week, was savaged by the cross-party work and pensions select committee after it found that many people had "not received the level of service from Atos which they can reasonably expect". MPs further claimed that a combination of the company's conduct and the test itself had prompted "fear and anxiety among vulnerable people". One GP who attended an Atos recruitment fair told the Observer she feared doctors could become "agents of the state" who were deprofessionalised by involvement in a system that did not make patient care its first concern. Campaigners for the disabled seized upon the development, claiming the government needed to go back to the drawing board. Richard Hawkes, chief executive of the charity Scope, said: "If the government wants to get disabled people off benefits and into work then it needs to get its assessment right. The test should be the first step on the road to employment. But disabled people's confidence in the work capability assessment is extremely low – and today's news will send it to rock bottom. "The test is massively flawed. Now it appears that it is being carried out by a large number of doctors who are under serious investigation." Neil Bateman, a solicitor who handles ESA appeals, said on two occasions his clients had been successful because, among other reasons, the doctor assessing them had qualified in Romania and registered with the GMC but had not been licensed to practise in Britain. Citizens Advice told the Observer it was compiling a dossier showing the problems being faced by those assessed by Atos staff, who can be nurses or physiotherapists in cases where there are no potential neurological disorders. It said it regularly found inaccuracies in many of the medical reports featured in ESA appeal papers that could affect people's chances of receiving benefits. It also found a lack of consideration for those being assessed. A spokesman said a barrister who was unable to practise because of cancer and lymphoma had described the assessment as being like an "interrogation" led by a computer. The assessor moved the client's legs, which caused her great pain, even though the client had warned that this would happen. In another case a claimant with learning difficulties who went for an assessment was found fit for work because he had found his way to the assessment centre on his own. When asked about this by Citizens Advice, he reluctantly explained that he had got up very early, taken the bus to the town centre, and then kept asking passersby for directions. He couldn't follow their instructions, so he would show the letter, walk in the direction they pointed, then ask again until he arrived. Two doctors employed by Atos have already been taken by the GMC to an independent panel for adjudication on their fitness to practise. Dr Alexandros Mallios, who it was claimed had not carried out a proper examination of his patient during an assessment, was cleared by the panel last October. Dr Usen Samuel Ikidde, who qualified in Nigeria, was given a formal warning in January, to lay on his records for five years, after he was found to have worked for Atos while on sick leave from an accident and emergency department. An Atos spokesman said: "Atos Healthcare is committed to providing a high-quality, professional service and requires these standards of all its employees. While we cannot comment on individual cases, any complaint made about an employee is taken extremely seriously. "In addition to our own rigorous internal investigations we will co-operate with any external investigation to ensure all facts are properly established and the appropriate action taken." The Labour government introduced work capability assessments in 2008 when it replaced incapacity benefit and income support for new claimants with employment and support allowance. The government has accelerated the changes and started retesting all 1.5 million incapacity benefit claimants to see whether they are eligible for the new benefit. A GMC spokesman said: "We can and do take action to remove or restrict a doctor's right to practise if there have been serious failures to meet our standards." 9/11 The Government &amp; Corporate Fascism.